California is "a dangerous minefield riddled with nasty fault lines that rupture without much warning, generating massive earthquakes that can level buildings, pulverize roads, and kill lots of people in the span of seconds" (1). The San Andreas fault could have a magnitude 8.4 earthquake*, according to experts (2). But maybe California will be lucky: Other experts think it might be an "8.2 mega-earthquake" (3). The earliest recorded "mega-quake" to hit Southern California was in 1857, estimated at 7.8 (4). The 1906 San Francisco earthquake killed more than 3,000 people, left nearly a quarter of a million people homeless (5), and was estimated to be a 7.9 (6). The 1989 Loma Prieta earthquake measured 6.9 (7), killed nearly 70 people (8), and caused an estimated $10 billion in damage (9). The 1994 Northridge earthquake (magnitude 6.7) killed nearly 60 people, and caused an estimated $20 billion in damages and nearly $50 billion in "economic loss" (10). The Northridge earthquake occurred on a previously unidentified fault line and caused severe shaking as much as 30 miles from the epicenter (11). Given these facts, can anyone believe it's possible to predict when, where, and how big California's next mega-earthquake will be? Yes, some people believe it's possible. Not coincidentally, these are the very same people who want to store millions of pounds of nuclear waste on the shores of California for an indefinite period of time, possibly centuries, possibly forever. The claim is specious at best, a complete fabrication at worst. San Onofre Nuclear [Waste] Generating Station, which was emergency-shutdown in January, 2012 due to a steam generator leak and never reopened (but left more than three million pounds of spent nuclear fuel on site), was built to withstand only a 7.0 earthquake, and the cement spent fuel "island" (known as an ISFSI (Independent Spent Fuel Storage Installation)) is only built to that standard. San Onofre officials claim that is good enough, because the maximum "anticipated" horizontal ground acceleration at the site is expected to be less than 0.67g (g refers to the force of gravity). California's building code for non-nuclear buildings require protection of 0.38g (12). So, something that can impact millions of lives and cost trillions of dollars in an accident, and cause the permanent exclusion of all habitation from a vast area (thousands of square miles for thousands of years), only needs to be built to withstand well less than double what a single-family dwelling in the same vicinity is required to withstand! Southern California Edison claims that 0.67g acceleration is good enough and points to the 2011 Fukushima-Daiichi catastrophe as proof, because those nuclear power plants experienced a 0.561g ground acceleration in the horizontal direction (13). However, the 2011 Tohoku earthquake occurred over 100 miles east of Fukushima. Like many earthquakes, the size of the Tohoku quake was largely unexpected. The San Andreas fault -- by no means the closest fault to San Onofre (that title goes to the Rose Canyon fault at the moment) -- is about 40 miles away at its closest point (approximately San Bernardino, California). The San Andreas fault slip rate is about 35 millimeters per years, and it tends to rupture every 140 years on average (14). The southern portion is now about 20 years overdue, and has built up approximately two feet of unrelieved slip stress. When it ruptures -- and it surely will -- it's going to be massive! Soon after the 2011 earthquake struck, Fukushima was inundated by a series of tsunami waves measuring some 20 to 30 meters in height. Could THAT happen at San Onofre? You bet it could -- and even higher! MUCH higher. SoCalEd claims their tsunami wall is 36 feet high. Yet activists measured its actual height -- about 14 feet! SCE uses "mean lower low tide" (15) as the basis of their measurement. Activists use where normal waves actually come up to on a regular basis. By either measurement, the tsunami wall at San Onofre is insufficient protection, and taking the wall into account at all is absurd: It's too weak, in poor condition due to decades of neglect, and even the Nuclear Regulatory Commission won't let SCE account for the tsunami wall in their safety evaluation (somehow, that doesn't matter to the NRC: They've approved San Onofre's nuclear waste dump anyway). But how likely is a tsunami? And how large might it be? As mentioned above, if you ask SoCalEd, their answer will be: "Not very likely, and not very big." But they -- and any researchers they pay -- are biased. "Large offshore earthquakes may directly generate tsunami through tectonic seafloor uplift or indirectly by triggering large submarine slope failures....their return periods appear similar to those of large earthquakes" (16). Infrequent? Yes. But when they occur, can they be devastating? YES. Legg states in his report that there is: "the potential for great loss from these infrequent offshore events." In 1812 a locally-generated earthquake estimated to have been between 7 and 7.5 generated a 10 to 13 foot run-up at Gaviota, California (17). Gaviota is located midway between Diablo Canyon and San Onofre. In 1927 a five-foot run-up occurred at Port San Luis after an offshore earthquake estimated at 7.3 magnitude. Port San Luis is about ten miles south of Diablo Canyon Nuclear [Waste] Generating Station. At least half a dozen smaller events have occurred in the past two centuries along SoCal's coasts (18). Just take a look on Google Maps in satellite view: What do you see offshore? VERY STEEP canyons, some culminating in islands, some entirely under water. Monterey Canyon "rivals the depth of the Grand Canyon itself" (19). Catalina Island, just over 20 miles due west of San Onofre Nuclear Waste Dump, rises 2,000 feet above the surface of the ocean, which "reaches depths of 3,000 feet between the island and the mainland" (20). The Legg report states that "the Santa Catalina Island restraining bend represents the most serious local tsunami threat to coastal southern California." The Rose Canyon fault runs between the nuclear waste dump and Catalina Island. In 2017 scientists at Scripps Institution of Oceanography stated that "offshore segments of the Rose Canyon and Newport-Inglewood faults could rupture and produce a 7.3 quake" (21) -- more than ten times more powerful than previously believed and three times more powerful than San Onofre is built to withstand. The overall shear rate of the Pacific and North America tectonic plates is about two inches per year (23) but due to various twists, turns, bends and overlaps, some areas can be much more aggressively separating, stretching, or piling up on one another. It is certainly a wonder that nuclear power plants were EVER built in California, and all the more surprising that any have remained operating, as scientists have tracked -- and Californians have experienced (and died from) -- massive earthquakes since the plants were built, between four and six decades ago. When they were built, citizens were told only a few years' worth of nuclear waste would ever remain on site. But that turned out to be a lie. The waste never had anywhere to go and still has nowhere to go. It takes centuries for nuclear waste to lose its deadly fission products by natural decay: Cesium, Strontium and so forth, and hundreds of millennia for the plutonium and other long-lived components (such as Americium) to decay. A few millionths of a gram -- a nearly invisible speck -- of plutonium is enough to cause lung cancer in 100% of people who inhale that amount. If we leave the waste on our coast, sooner or later a tragedy will occur. But if we remove it, it will still be SOMEONE'S problem. There is no place on earth that is immune from earthquakes, volcanoes, tornados, or asteroid impacts, to name a few natural disasters, and no coastal location immune from tsunamis. Nor is any place immune from atomic-bombs delivered by ballistic missile or enemy aircraft, or from sabotage by insiders or other terrorists. That's why shutting down Diablo Canyon is the most important step Californians can take to protect against a man-made (and possibly nature-aided) disaster. That is why the ISFSI at San Onofre is insufficient, the location lousy, and the gall of anyone who says otherwise, astounding. *All earthquake magnitudes presented in this document are based on the Richter scale, which is a logarithmic scale (an increase of one unit (for example, from 7.4 to 8.4) represents 10 times more energy released; an increase of two units (say, from 6.9 to 8.9 represents 100 times more energy released). Nov. 30, 2018 update: A 7.0 earthquake has just struck near Anchorage, Alaska, with a 5.7 aftershock and dozens of aftershocks > 3.0. Roads, bridges and buildings have been damaged. A tsunami warning has been issued in the area. One earthquake can trigger a multitude of additional, sometimes larger, earthquakes nearby. A 7.0 can trigger earthquakes as far as 100 miles away. (21): https://www.sandiegouniontribune.com/news/science/sd-me-rose-canyon-20170531-story.html "The paper added to long held beliefs by scientists that California�s offshore faults can be as perilous as those that are on shore." 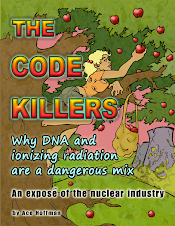 An Expose of the Nuclear Industry"
Please conserve resources: Do not print this email unless absolutely necessary.